I find it really odd that a year after the show has aired Showtime are still pushing it. A panel at comic con among other things. Just seems odd to keep milking it if they’re indeed done. ryanmj1993 wrote: I find it really odd that a year after the show has aired Showtime are still pushing it. A panel at comic con among other things. Just seems odd to keep milking it if they’re indeed done. Maybe they don't know whether or not it will continue, but because it might, they don't want it to fade from memory. Another explanation, perhaps more likely, is that they want to keep broadcasting the prestige of Twin Peaks so as to attract other creators and subscribers, and of course to keep up interest in Twin Peaks home media and the not insignificant industry of official Twin Peaks merchandise. Showtime's CEO has commented on how unprecedented and lasting their merchandise sales have been with Twin Peaks. There was also the push for Emmy nominations, and there continues to be at least some potential for Emmy wins. In short, they've got every reason to keep Twin Peaks in the public eye, and the actors will always be game because they have fun and because it helps them to promote themselves. are they contracted to do it? Does x months of publicity after the fact get included when they sign up, or is it optional and basically for some expenses-paid laughs? The comic-con appearances can't be contractual. I suppose they choose to appear. NormoftheAndes wrote: The comic-con appearances can't be contractual. I suppose they choose to appear. I wouldn't think they would need to be contractual, it's a good money making opportunity for those who choose to appear (from what I understand). I think the buzz around the show & the attention that is still going on with stuff coming out about it at Comic-Con panels & more panels that are happening In Austraila. Even though the new season ended in September last year i reckon the things will start to quite down sometime after the Emmy awards In September. Or going into next year even more so if we still have not heard anything about a season 4 happening yet or at all? Is when i think we will be hearing less about Twin Peaks from most places. The buzz & excitement of it all will be gone the actors will be moving on to other projects of course. So whatever happens in these next few months or nothing at all concerning news about Twin Peaks we might as well enjoy it. Terence wrote: I think the buzz around the show & the attention that is still going on with stuff coming out about it at Comic-Con panels & more panels that are happening In Austraila. The buzz and excitement is far from over. After an entire year, I am still enthralled by Twin Peaks, still digesting everything and processing the many layers. Most shows are slick but shallow. You consume them, experience a brief satisfaction, then they are quickly forgotten, having left no real impression and having provided little to no food for thought. Twin Peaks is a world apart from such productions. It's not just entertainment, it's art. What I've learned from art is that it can be revisited many times over, often providing a different experience each time, depending on where the viewer is currently situated in life, emotionally and so on. Also, moving on to other projects does not mean that the cast and crew will lose their love or enthusiasm for Twin Peaks, as has already been demonstrated over the past few decades. I agree with this thought 100%. Not to pick on Westworld (or worse, spoil it) but after the Season Finale there wasn't the desire to go back and continue to parse the material for thoughts, clues, ideas, themes like TP:TR. I can't even begin to count how many times i have re-watched these episodes. I fall asleep to SHO-Anytime on my tablet -- it just queues up the next ep and runs through my dreams when i fall asleep. Affects them as well i believe. Actually the length of the show/movie helps the re-watch because it'll be a week or so before i get around to that ep again -- and it always seems fresh. Well i mean going into next year we will be hearing less about the show from the people that made it. Theres hardly going be Comic Con panels next year if no new season is announced. But of course this show will always be talked about by the fans of it compared to most shows of course. With the Blue Rose magazine also been released every few months. Of course if a new season 4 is announced that would be even better again..
Terence wrote: Well i mean going into next year we will be hearing less about the show from the people that made it. Well, I want more Twin Peaks as much as you do, but even without a Season 4 there are many other things that could still be in the works. What other things do you think could be in the works besides a season 4 though? Terence wrote: What other things do you think could be in the works besides a season 4 though? Heck, they could be working on any number of things -- a video game, another film, or even a related show featuring a protagonist other than Cooper. Mulholland Drive originated as a story about Audrey so anything is possible. I do find myself wondering more and more where Season 4 could go. We could see them trying to hunt for Cooper, but would yet another series where they try and find a lost Cooper be satisfying? Maybe I'm simply making peace with the ending- it hints at more story to come, but I'm not desperate to see it. 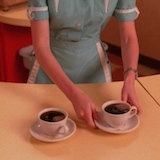 I've also realised, to my surprise actually, that if the series had ended simply with the green glove fight (then, say, a scene of Cooper eating cherry pie and drinking coffee in the double R), that wouldn't have been as satisfying as the ending we got. Then again, I predicted practically nothing of what happened in S3 in advance, and loved it. So I have assume a S4 would be awesome. But even if it is announced, it's not clear that everyone involved will stay healthy if it takes years to make. Who am I kidding - of course I want a S4!! !